Never underestimate the importance of visitor comfort when staging events. Our outdoor booth canopies protect attendees from the sun and the rain. Shelter from the elements will be appreciated by your guests — and your staff. Each one of our canopy tents comes with optional half or full-wall flaps for more coverage when needed. Blank awnings hail from our economy line, but the quality is on par with more expensive models. These models feature no extraneous detail. No graphics. 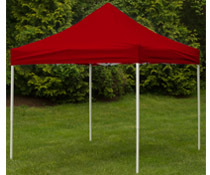 No adornment — only exactly what you need to create shade and shelter during an event. The simplicity of our straightforward exhibit awning puts the spotlight on displayed crafts, concession food for sale, promotional brochures, event schedules and more. Each of these outdoor booth canopies holds up after frequent use due to the quality of the fabric and durability of the frame and poles. It takes only minutes to set up our pop-up sidewall awnings. Event staff will appreciate the efficiency after a long and hectic day! These collapsible covers break down in seconds. What a relief! 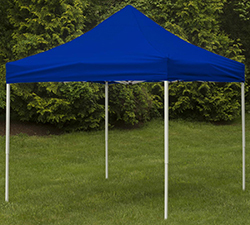 Outdoor booth canopies boast rugged polyester canvas that is both water-proof and fade-resistant. 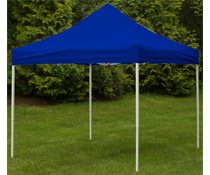 Our unprinted stock tents come in the standard colors: white, black, red, green, and royal blue. They are lightweight, portable, and easy to take on the road. A nylon carry case with wheels solves the problem of hauling this fixture when your location is a ways away. Hate lugging around a heavy bag of tools? You won't need any! Set-up takes just minutes. The plain design of our blank canvas pop-up shelters reduce the price on our economy awnings without sacrificing quality. They come with four side panels so you have lots of shelter options. In the summer, more flaps down means staying cool - and in the fall, no flaps down to let the breeze and sunlight in. What is the construction of these canopy tents like? Our 10'x10' outdoor booth canopies have a square shape that is big enough to hold guests seeking snacks, information, or shelter. Don't be fooled by the lightweight design of this stand - this is a sturdy awning system! For reinforcement in windy weather, ground stakes are included to keep the unit secure. The portable canopy has a truss-style frame with steel construction and a powder coated finish that resists nicks and scratches. The legs have spring-loaded locks so each corner snaps into place with one easy turn, saving fingers from injury. Height adjustable legs give the user even more flexibility when setting up their space. The canopy features hook-and-loop straps that go around each pole at two foot increments. 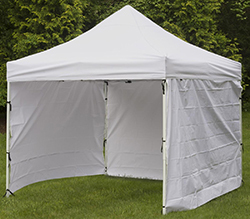 Polyester sidewalls for 10'x10' tents can be zipped on and off depending on how much shade is desired. The steel frame is powder coated for durability. Ground stakes anchor the awning down so everything stays put -- a boon, especially with a lot of activity inside and maybe even a little dancing! Concert-goers like shopping the craft exhibitor booths in between concerts. Create a temporary showroom for merchandise like apparel, hats, beaded bags, and sunglasses. Carved wood craft and toys are also a big hit on the festival circuit. Keeping babies and the elderly out of strong sunlight is important, so create shade spots for that purpose. 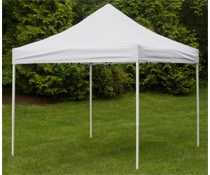 Our blank canopies are also great for residential use - think family reunions and graduations in the backyard. Or, the temporary pavilions can be used to create extra space at catered events for special activities. Wondering how you’ll spread the word without custom artwork? That’s easy. People need only see a gathering of folks under a tent to figure out where the fun is! Well constructed, easy to assemble tents last for years, and when you buy ours, rest assured you’ll appreciate the time and money saved! Let Displays2go throw some shade your way with affordable trade show awnings. Our customers tell us they’d give us ten stars if they could for top quality merchandise, customer service, and fast shipping. Let us show you why we deserve the compliment!